Numerous towers, military fortresses, fortress-towns existed in historical Azerbaijani lands –present-day Republic of Armenia. Medieval and Russian invasion period sources inform on Irevan Fortress, Kechi Tower, Sardarabad Tower, Talin Tower, Gumru Tower, Shoreyel Tower which existed in the territory of the present day Armenia for fortification. The most grandiose and frequently mentioned in the researches still nowadays is Irevan Fortress. All the mentioned towers had been gradually wiped off the face of the earth by Armenians after the conquest of Irevan khanate by Russian troops. The first written source on Irevan Tower dates back to the Safavids dynasty. In 1502 the troops of the Safavid ruler Shah Ismayil seized Irevan city defeating Garagoyunlu Emirs. In the 40s of the XVII century renowned turkish traveler and geographer Evliya Chelebi who travelled to Caucasus stated that in Hijri 915 (1509-1510) Shah Ismayil ordered his vezier Revangulu khan to build a tower which the latter had built for seven years that was named in his honor “Revan Tower”. The seats of Irevan rulers, beys and khans was Irevan Fortress in the reigns of the Safavids, Nadir Shah, the Gajars and the Ottomans. In the wars between the Safavids and Ottomans Irevan Fortress changed hands 14 times. After defeat of Safavid ruler Shah Ismayil in the Chaldiran battle to Ottoman ruler Sultan Selim in 1514, Irevan Tower was seized by turks and ruled by Ottomans for 7 years. After Sultan Selim’s death in 1521, Shah Ismayil took Irevan back from turks. Irevan Tower was conquered by turks again in 1534 and Safavid troops liberated it in 1551 in Shah Tahmasib’s reign. During Sultan Suleyman’s marching to South Azerbaijan in 1554 Turks retook Irevan Fortress. Turkish historian Ibrahim Pechevi wrote that about July 19, 1554 AD, Turkish armies entered Revan city which was actually considered the heart of Iran and burned and destroyed palaces, parks, gardens of khans, sultans, particularly, paradise like garden called “Bag-i sultaniyye”. According to the peace treaty between the Ottomans and the Safavids in 1555, Irevan was returned to the Safavids again. In 1579 during the reign of Irevan ruler Tokhmaq khan (his real name was Mahammad khan), Turkish armies attacked Irevan under Lele Mustafa Pasha, commander-in-chief of Ottoman armies, and destroyed all the buildings within the tower and razed them to the ground. Afterwards, according to the treaty between the two states, Turkish armies left Irevan province and in a short time, Tokhmaq khan rebuilt and turned it into well developed area again. In 1583 in the reign of Sultan Murad Khan III, a commander of Turkish troops Farhad Pasha attacked Irevan Tower and took it without any fight. After taking the fortress, Farhad Pasha commenced building defensive installations. He rebuilt and extended Irevan Fortress. E. Chelebi wrote that an army of 150-thousand Ottoman soldiers rebuilt the tower within 45 days over the Zangi River and equipped it with military supplies in 40 days. Later, though Irevan Fortress changed hands a number of times, the fortress walls built by Farhad Pasha endured against all the attacks. After eight-month siege in 1604, the troops of Shah Abbas I retook Irevan Tower from Turks. In August 1635, the troops of Sultan Murad IV conquered Irevan Fortress after the 9-day siege. The fortress walls, watchtowers, defensive installations were seriously damaged due to shelling of the artillery and the palace of Tahmasibgulu khan of Irevan was totally destroyed. Tahmasibgulu khan was taken a prisoner and sent to Istanbul. Turkish garrison of 15-thousand soldiers was deployed to the fortress. According to the Qesri-Shirin treaty signed between the Safavids and Ottomans in 1639, demarcation of the border between the two states was from western Arpachay and eventually peace lasted for about 80 years. French traveler Jean Tavernier was in Irevan in 1655. In his book written based on his travel notes, he described Irevan city and fortress and included the city plan. According to Tavernier, built over the hill on the bank of the Zangi river, with 5 towers and strong defensive installations Irevan fortress had a gate opening to the north. Tavernier wrote that the inhabitans of the fortress were only Muslims. Irevan fortress was one of the four living quarters. There was Bazaar Square between the fortress and other quarters (Shehri (or Old city), Tepebashi and Demirbulag). The Ottoman troops invaded Tiflis in 1723 and one year later they seized Irevan though at the expense of big casualties. Commander of Turkish troops Rajab pasha strengthened the walls of Irevan fortress and a mosque was built inside it. About eleven years later Nadir Shah liberated Irevan fortress from the Ottomans. After the assasination of Nadir Shah in 1747, the khanate of Irevan gained independence. Despite conflicts and disagreements among khanates, Irevan khanate could mainly keep its independence. In order to strengthen her position in South Caucasus Russia started military operations in early XIX. After conquest of Ganja khanate in January 1804, the following target of Russian troops was Irevan khanate. Khan of Irevan Hussaingulu khan Gajar succeeded to strengthen Irevan fortress in 1807 by involving French engineers. Cannon and powdermaking plants were built in Irevan fortress, additional troops were placed and the walls were strengthened. I. Gudovich wrote that Irevan tower was strengthened based on occidental military rules, it had two walls, ditches were dug in front of the walls, and soil and sand hills were created before the walls and cannons were installed, fougasse bombs were there which did not exist before. The second attack of the Russian troops to Irevan fortress was in September 1808. The Russians seized Uchkilse (Echmiadzin) monastery on September 27 and built their camps around Irevan. But that time they could not occupy Irevan fortress either. Eventually, on September 15, 1827 the Russian troops seized Sardarabad tower after long blockade. After it, all the forces were directed to Irevan fortress under the command of Ivan Paskevich. On October 1, 1827 the Russian troops first seized south-western tower of the fortress and then by breaking the northern gate (Shirvan gate) entered the fortress. After invasion of the fortress I. Paskevich in his report to Nicolas I wrote that the Emperor’s flag was already flying over Irevan fortress walls, the keys of the very famous fortress were in his hands, the whole garrison was taken prisoner, 37 cannons, 2 howitzers, 9 mortars, about 50 falconets were plundered. With the conquest of Irevan fortress which was called “unsurrendered fortress”, invasion of Northern Azerbaijan khanates by Russia was completed as a result of 23-year intermittent warfare. In conquest of Irevan Fortress, Armenian betrayal and treason again played a big part. Well familiar with the local area, Armenians guided for Russian military, fingered the weakest defence points of the fortress and spied. For his deeds in the seizure of Irevan Fortress I. Paskevich was rewarded with the title of “Count of Erivan” and the II class St George medal. Other generals also received higher rewards. After a while a special medal was struck for “Seizure of Irevan Fortress”. By the order of the Emperor, Archbishop Nerses was rewarded with St Alexander Nevskiy Order for his service during the invasion of the Irevan Fortress. 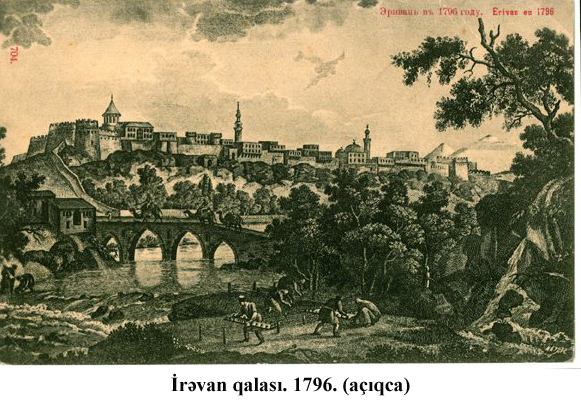 The news on the conquest of the Irevan Fortress was delivered to Russian Emperor Nicolas I when he was in Riga. After the seizure of the fortress, brother of Irevan khan, Hassan khan’s sword was presented to the tsar, which is kept in Armoury Chamber of the Kremlin currently. In return, the tsar presented the sword to the city hall in the memory of being in Riga. Having returned to Petersburg, the Emperor went to the church in the Winter Palace with his family on November 8 to pray on the occaison of the seizure of Irevan Fortress. He displayed the keys and 4 flags taken during seizure of Irevan Fortress in the streets under applauds of the inhabitants of the capital. Immediately after the seizure of the fortress in 1725 first, the crescent in the dome of the mosque built by Ottoman commander Rajab pasha was changed to a cross, a church bell was installed in its minaret and converted into Orthodox church. Sardar Mosque of the fortress was changed into arsenal of the Russian troops and harem of the khan into hospital. A picture painted by artist, academician V. Moshkov who observed artillery attack of the Russian troops on the Irevan Fortress, called “Seizure of Irevan fortress” is kept in the History Museum of Irevan city at present. Another Russian artist of battle scenes, academician Franz Rubo described the scene of seizure of Irevan fortress. That painting is kept in the History Museum of Armenia currently. According to the calculations based on the scale of the scheme of the Irevan fortress compiled after its conquest, it was an approximate square with 850m length and 790 m width, covered 7 ha area. The height of dual walls was 10.5-12 m. One layer walls of the fortress passed over the rocks washed by the Zangi river. The fortress had three gateways: Tabriz gateway to the south, Shirvan (or Meydan) gateway to the north and Korpu gateway. The bridge was laid out over the Zangi river between Meydan gateway and the Old city in 1679 which was called Qirmizi Korpu (Red Bridge). After the invasion, Irevan fortress was declared public property. In 30s of XIX century public enterprises and organisations were placed in more than 120 buildings of the Irevan fortress. In 50s various construction and restoration works were carried out in the fortress. The Russian military units and tens of cannons were stored in the fortress. The Irevan fortress retained its status as military fortress till March 12, 1864. After formal dissolving of the fortress as a military object, the inhabitants living around destroyed and took stones of the walls and towers. From 1880s buildings and defensive installations within the fortress had disappeared after one another. A merchant called Nerses Tahiryan bought some part of the fortress in 1865 and had built a winery (present cognac plant) there. After establishment of the Soviet Government in Armenia general plan of the city was approved in 1924. As the majority of the researchers confirm, the main objective of the plan developed under supervision of Alexandr Tamanyan was to erase Azerbaijani historic-architectural buildings from the earth. A new general plan of the city was prepared in 1936 and due to its realisation modern high buildings were constructed within the fortress. The pictures taken during WWII still show some parts of Irevan fortress. But later, the walls were totally destroyed and at present there is no sign of them. The walls of the Old city in Baku, Shirvanshahs Palace inside it, Khan’s Palace in Sheki which are of the same age as the Irevan fortress, stand today as relics of the past. There isn’t even a single medieval historic monument left in Irevan today. It is the result of razing Azerbaijani historic-architectural monuments that there is no monument left in Irevan above 200 years old. At present, a model of Irevan fortress prepared by modern Armenian architects is displayed in Irevan city History Museum. The model shows that not all the buildings which existed in the fortress are depicted there. “The key of Irevan fortress” allegedly, taken after Russian conquest is also displayed there. In recent years, the leaders of Armenia are intending to carry out a new project under the title “Irevan fortress”. The Armenian officials have three objectives in this matter. First, to have opportunity to display a small sample from “old Irevan” to foreign guests, second, to have a chance to display tolerant attitude of Armenians to oriental culture, muslim heritage, third, to take enourmous benefit from “Sardar Palace”, trade stalls, bazaars, caravanserais, oriental baths, etc. to be built in XVII-XVIII centuries architecture style witihin “Irevan Fortress”. The estimated cost of the project to be built in 184 ha area in the suburb- former Yenikend, present residential area called Noragyoug is about 6-7 billion USD. During ex Moscow city mayor Yuri Luzhkov’s visit to Irevan in January 2010, Armenian officials pursuaded him and his stakeholders to finance the project of “Irevan fortress” and reached assent. But after Y.Luzhkov was ousted from his position as mayor, the project of “Irevan fortress” has been postponed until a new sponsor is found.